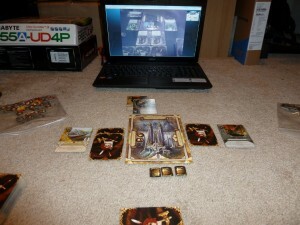 Since I moved a couple of years ago I have not been able to play as many tabletop games as I would like. This is in part due to being too far from the people I used to play with. After picking up Warhammer: Invasion (check out my review), Tewfik and I decided to try something a bit different, playing over the internet. There are various programs out there for playing tabletop games over the internet, and specifically a couple for card games (OCTGN and LackeyCCG), but we had just purchased these new cards and I personally feel like it’s a better experience when you can physically shuffle a deck and hold a hand of cards rather than see it on a computer screen. So how do you play over the internet? 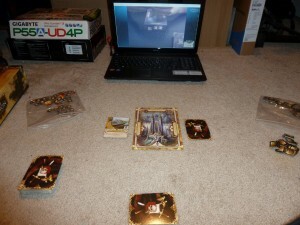 Well, we decided to use a video chat (via Skype) to simulate sitting across the table from the other player. We took a few minutes to connect to a video chat and sat our computers across from us and aimed the cameras at the playing field. This way we could each see the other person’s cards as if they were actually sitting across from us. The quality on our cameras was not great so we could not read all of the text on the cards, but at the very least we could see the images and positioning of the cards, as well as any tokens/counters. One thing that we did was read off the title and if necessary the text of any cards coming into play so the other player knew what we were playing and simply ask the other player what a card was or what the effects were if we needed to. If you are not familiar with all of the cards you could keep open something like CardGameDB to look up the full text on cards pretty easily. Close Up View of the Laptop... with glare. While this may not have been perfect, we managed to get the experience of physically playing cards while sitting 50 miles from each other. It is not quite the same as getting together with some friends to play games but I would call it a great success! I think this is a great thing for people like myself who do not know many players nearby but like physically playing games instead of using virtual materials. There are a few other things to consider if you are going to attempt this. 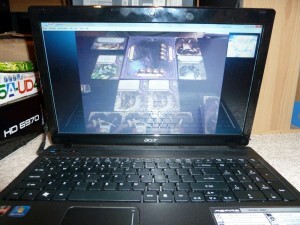 Both players need a laptop or PC with a webcam somewhere with enough space to play cards and sit the computer across from them. There is the problem of players being able to cheat off camera, but this should not be an issue if you are playing with people you know. If you do play with random strangers you could institute rules that you may not move any cards outside of the visibility of the camera or something similar to less the possibility of someone cheating. I look forward to trying this out again. I would even like to try it out with some new people, so if anyone is interested maybe send me an email and we could try it out. This entry was posted	on Monday, December 12th, 2011 at 6:32 pm	and is filed under How-To. You can follow any responses to this entry through the RSS 2.0 feed. You can leave a response, or trackback from your own site. Powered by WordPress v 5.1.1. Page in 1.247 seconds.